Jared Unzipped: States I Won't Reside In (And Neither Should You) - Part I. States I Won't Reside In (And Neither Should You) - Part I. Presented below is a map of the United States. 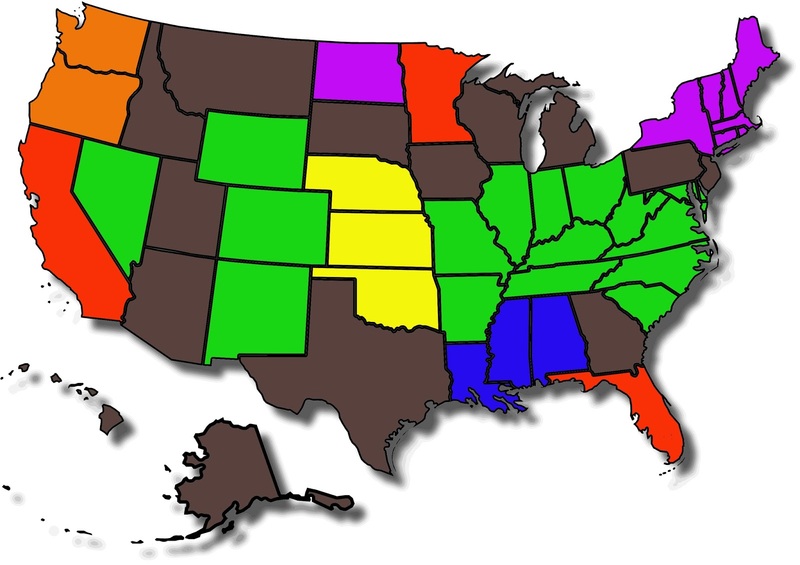 I have color coded each state to represent places I would and would not be interested in residing in long term, as pertaining to its respective climate and threat of natural disasters. This map does not represent states where I would feel uncomfortable to live because of the political and social climate, which is for another article entirely (Part II). You might find this map to be peculiar, but I consider very seriously the climate of a region. As an intelligent, responsible adult, you must take it upon yourself to wisely choose a place to live. If you choose to live in areas where natural disasters strike often, then I have little pity for you should you lose your home or perish. I'll explain further, by color and the associated hazard. Hurricanes (Blue) - Many states along the Gulf Coast are hammered regularly by dangerous hurricanes. It seems senseless to have a home in such an area, especially when the land is so close to sea level (or in some cases, below it). If you live in New Orleans by choice, then you're a buffoon. Only Specific Areas (Brown) - If a state is brown on the map, that means I probably wouldn't consider living in most parts of it. I only believe a specific area or city to be safely habitable. For example... Idaho is flush against Washington and Oregon, where seismic and volcanic threats are high. As such, I'd only consider living in the central or eastern region of Idaho. As with Iowa, the western portion of the state is in Tornado Alley, but the eastern side is relatively safe. With Georgia, I would only consider the very northern portion of the state, which is far enough away from the Gulf Coast. You get the idea. No Major Reason Not To Live Here (Green) - These are states where potential natural disasters and climate present a low, manageable threat. Most (but not necessarily all) of the land in these states is habitable long-term. Obviously, areas near the coast line would be excluded. Seismic / Volcanic Activity (Orange) - This is an area where the threat of earthquakes and volcanic eruptions are the most severe. Obviously, states like California fall into this category, but Oregon and Washington do as well. Most folks are unaware of the danger presented by the Cascadia Fault, which runs through the Pacific Northwest. As such, this region is a ticking time bomb waiting to explode. High Snowfall / Blizzards (Purple) - I personally like snow, but I do not want to spend extended periods of time trapped without the ability to move around. High snowfall totals also present problems with driving, which many people are not skilled enough to handle. Along with snow and blizzards come prolonged power outages. Thanks, but no thanks. More Than One Reason (Red) - States painted red are places I would never even remotely consider residing. California faces not only earthquakes, but also severe drought. Minnesota faces intense snowfall and blizzards in the northern part of the state, while the southern portion is within Tornado Alley. Florida is prone to hurricanes and extremely hot temperatures. Tornadoes (Yellow) - These are areas that regularly suffer tornadoes. It seems year after year, folks rebuild their homes directly in the path of common tornado strikes. This is absurd to me -- why anyone lives here, I have no idea.